Applications of Soft Computing/Machine Learning Techniques, Data Mining, Artificial Intelligence, Advance Computer Networks, Image Processing, Theoretical Computer Science. Abinash Pujahari, Dilip Singh Sisodia. Modeling Side Information in Preference Relation based Restricted Boltzmann Machine for Recommender Systems, Information Sciences, vol. 490, pp.126-145, 2019. (Indexed in SCIE (IF 4.305), Scopus). D. Singh, D.S. Sisodia, P. Singh. Evolutionary Based Ensemble Framework for Realizing Transfer Learning in HIV-1 Protease Cleavage Sites Prediction, Applied Intelligence, 49(4), pp.1260-1282, 2019. (Indexed in SCIE (IF-1.905), Scopus). Deepak Singh, Dilip Singh Sisodia, Pradeep Singh. Cognitive Framework for HIV-1 Protease Cleavage Site Classification using Evolutionary Algorithm, Arabian Journal for Science and Engineering, 2019 (Indexed in SCIE (IF 1.092), Scopus). (In Press). Arati Anuragi, Dilip Singh Sisodia. Alcohol Use Disorder Detection Using EEG Signal features and Flexible Analytical Wavelet Transform, Journal of Biomedical Signal Processing and Control, 2018. (Indexed in SCIE (IF 2.783), Scopus). (In Press). D. Singh, D.S. Sisodia, P. Singh. A New Multi-Objective Evolutionary approach for the Performance Improvement of Learners using Ensemble Feature selection and Discretization Technique on Medical data, Journal of Current Medical Imaging Reviews, Vol.14(1), 2018 (Indexed in SCIE (IF 0.308), Scopus). D. Singh, P. Singh, D.S. Sisodia. Evolutionary-based Optimal Ensemble Classifiers for HIV-1 Protease Cleavage Sites Prediction, Expert Systems with Applications, vol.109 pp. 86-99, 2018. (Indexed in SCIE (IF-3.928), Scopus). D.S. Sisodia, V. Khandal, and R. Singhal, “Fast Prediction of Web User Browsing Behaviours Using Most Interesting Patterns,” Journal of Information Science, 44(1), pp. 74-90, 2018. (Indexed in SCIE (IF-1.939), Scopus). D.S. Sisodia, S. Verma, O.P. Vyas “A Discounted Fuzzy Relational Clustering of Web Users’ Using Intuitive Augmented Sessions Dissimilarity Metric,” IEEE Access, vol. 4(1), pp. 6883 - 6893, 2016. (Indexed in SCIE (IF-3.244), Scopus). D.S. Sisodia, S. Verma, O.P. Vyas “Augmented Intuitive Dissimilarity Metric for Clustering Of Web User Sessions”, Journal of Information Science, 43(4), pp. 480-491, 2017. (Indexed in SCIE (IF-1.939), Scopus). D.S. Sisodia, U. Verma. The Impact of Data Re-Sampling on Learning Performance of Class Imbalanced Bankruptcy Prediction Models, International Journal on Electrical Engineering and Informatics, 10(3), pp.433-446, 2018. (Indexed in Scopus). D.S. Sisodia, R. Singhal, and V. Khandal, “Comparative Performance of Interestingness Measures To Find Redundant and Non-Informative Rules From Web Usage Data” International Journal of Technology, 9(1), 2018, pp. 201-211. (Indexed in ESCI & Scopus). D.S. Sisodia, "Augmented Session Similarity Based Framework for Measuring Web User Concern from Web Server Logs," International Journal on Advanced Science, Engineering and Information Technology, 7(3), pp. 1007-1013, 2017. (Indexed in Scopus). D.S. Sisodia, S. Verma, O.P. Vyas “A Subtractive Relational Fuzzy C-Medoids Clustering Approach To Cluster Web User Sessions from Web Server Logs” International Journal of Applied Engineering and Research, 12(7), 2017, pp 1142-1150. (Indexed in Scopus). D.S. Sisodia, Sagar Jadhav “Evaluation of Mutual Influence and Correlation Performance between Global Stock Indices Using Unsupervised Learning”, International Journal of Applied Business and Economic Research, Vol. 15(19), 2017, pp.125-137. (Indexed in Scopus). D.S. Sisodia, R. Singhal, and V. Khandal, “A Comprehensive Comparative Performance of Different Mobile Ad-Hoc Network Routing Protocols with Increasing Node Instances” Far East Journal of Electronics and Communications, 17(5), 2017, pp. 1047-1064. (Indexed in Scopus). D.S. Sisodia, R. Singhal, and V. Khandal, “A Performance Review of Intra and Inter-Group MANET Routing Protocols under Varying Speed of Nodes” International Journal of Electrical and Computer Engineering, 7(5), pp. 2721-2730, 2017. (Indexed in Scopus). Sisodia, D.S., S.Nair, P. Khobragade. “Diabetic Retinal Fundus Images: Preprocessing and Feature Extraction for Early Detection of Diabetic Retinopathy” Biomedical and Pharmacology Journal, 10(2), pp. 615-624, 2017. (Indexed in Scopus). D.S. Sisodia, S. Verma, O.P. Vyas “Performance Evaluation of an Augmented Session Dissimilarity Matrix of Web User Sessions Using Relational Fuzzy C-means clustering” International Journal of Applied Engineering and Research, 11(9), 2016, pp 6497-6503. (Indexed in Scopus). D.S. Sisodia, S. Verma, O.P. Vyas “A Conglomerate Relational Fuzzy Approach for Discovering Web User Session Clusters from Web Server Logs”, International Journal of Engineering and Technology”, 8(3), 2016, pp 1433-1443. (Indexed in Scopus). D.S. Sisodia, S. Verma, O.P. Vyas “Quantitative Evaluation of Web User Session Dissimilarity measures using medoids based Relational Fuzzy clustering”, Indian Journal of Science and Technology, 9(28), 2016, pp 1-9. D.S. Sisodia, S. Verma, O.P. Vyas. A Comparative Analysis of Browsing Behavior of Human Visitors and Automatic Software Agents. American Journal of Systems and Software, 3(2), 2015, pp 31-35. Sisodia, D.S, Verma, S. and Vyas, O. (2015) Agglomerative Approach for Identification and Elimination of Web Robots from Web Server Logs to Extract Knowledge about Actual Visitors. Journal of Data Analysis and Information Processing, 3(1), 1-10. D.S. Sisodia and S.Verma “Application of Weblogs to Construct Smart Web servers to handle user Traffic efficiently’ International Journal of Advanced Computer Engineering and Architecture, Vol. 1, No. 1, Number 7, 2011, pp 141-152. Sisodia, D. S., & Reddy, R. (2019). Analysis of Public Sentiments about Mega Online Sale Using Tweets on Big Billions Day Sale. In Sentiment Analysis and Knowledge Discovery in Contemporary Business (pp. 59-76). Hershey, PA: IGI Global. Singh, D., Sisodia, D.S, Singh, P. (2019). Genetic Algorithm based Pre-processing strategy for High Dimensional Micro-array Gene Classification: Application of Nature Inspired Intelligence In Handbook of Research on Nature-Inspired Algorithms for Big Data Frameworks. Hershey, PA: IGI Global. Sisodia, D.S. & Shukla, A. (2019) Investigation of Feature Selection Techniques on Performance of Automatic Text Categorization. In Data, Engineering and Applications, Vol.-I, pp.71-82. Springer, Singapore. Sisodia, D.S., Reddy, N.K., Bhandari, S. and Pujahari, A. (2019) A Comparative Performance of Learners for Sentiment Analysis of Movie Viewers using Open Reviews. In Performance Management of Integrated Systems and it's Applications in Software Engineering, Springer, Singapore. (In Press). V. G. Shankar, D. S. Sisodia, P. Chandrakar “DataAutism: An Early Detection Framework of Autism in Infants using Data Science”. In Proceedings of International Conference on Data Management , Analytics & Innovation (ICDMAI 2019), Kuala Lumpur, Malaysia, January 18-20, 2019. R. Rai, D.S. Sisodia “Real Time Data Augmentation Based Transfer Learning Model for Breast Cancer Diagnosis Using Histopathological Images”. In Proceedings of International Conference on Biomedical Engineering Science and Technology: Roadway from Laboratory to Market (ICBEST 2018), Raipur, India, December 20-21, 2018. D. S. Sisodia and N. Verma “A Framework for Preprocessing and Feature Extraction from Weblogs for Identification of HTTP Flood Request Attacks ". In Proceedings of IEEE International Conference on Advanced Computing and Technology (ICACAT-2018), Bhopal, India, December 28-29, 2018. D. S. Sisodia and N. Verma “A Performance Evaluation of Density-Based Clustering Methods for Categorizing Web Robots Sessions". In Proceedings of IEEE International Conference Advanced Computing and Technology (ICACAT-2018), Bhopal, India, December 28-29, 2018. S. Agrawal, D. S. Sisodia, N. K. Nagwani “Neuro-Fuzzy Approach for Reconstruction of 3-D Spine Models using 2-D Spine Images and Human Anatomy”, In Proceedings of International Conference on Next Generation Computing Technologies (NGCT 2018), Dehradun, India, November 21-22, 2018. D.S. Sisodia, A. Verma “Performance of Unsupervised Learning Algorithms for Online Document Clustering". In Proceedings of IEEE International Conference on Inventive Research in Computing Applications (ICIRCA), Coimbatore, India, July 11-12, 2018, pp.920-925. D.S. Sisodia, R. Khandelwal, A. Anuragi “Categorization Performance of Unsupervised Learning Techniques for Web Robots Sessions". In Proceedings of IEEE International Conference on Inventive Research in Computing Applications (ICIRCA), Coimbatore, India, July 11-12, 2018, pp. 1370-1374. D. Sisodia and D.S. Sisodia “Prediction of Diabetes using Classification Algorithms". In Proceedings of International Conference on Computational Intelligence and Data Science (ICCIDS 2018), Gurugram, India, April 7-8, 2018, pp.1578-1585. D.S. Sisodia, R. Borkar and H. Shrawgi “Performance Evaluation of Large Data Clustering Techniques on Web Robot Session Data ". In Proceedings of International Conference on Machine Intelligence and Signal Processing (MISP-2017), Indore, India, December 22-24, 2017, pp.545-553. D.S. Sisodia, M. Choudhary, T. Vandana and R. Rai “Agglomerative Similarity Measure based Automated Clustering of Scholarly Articles". In Proceedings of International Conference on Machine Intelligence and Signal Processing (MISP-2017), Indore, India, December 22-24, 2017, pp. 533-344. D.S. Sisodia, R. Agrawal, D. Sisodia “A Comparative Performance of Classification Algorithms in Predicting Alcohol Consumption among Secondary School Students". In Proceedings of International Conference on Machine Intelligence and Signal Processing (MISP-2017), Indore, India, December 22-24, 2017, pp.523-532. D.S. Sisodia, M. Singh “An Empirical Investigation of Discretization Techniques on the Classification of Protein-Protein Interaction". In Proceedings of International Conference on Machine Intelligence and Signal Processing (MISP-2017), Indore, India, December 22-24, 2017, pp.509-521. D. Singh, D.S. Sisodia, and P. Singh “An Empirical Analysis of Instance-based Transfer Learning Approach on Protease Substrate Cleavage Sites Prediction". In Proceedings of International Conference on Machine Intelligence and Signal Processing (MISP-2017), Indore, India, December 22-24, 2017, pp. 59-70. D.S. Sisodia, K. Sachdeva, A. Anuragi “Sleep Order Detection Model using Support Vector Machines and Features Extracted from Brain ECG Signals". In Proceedings of IEEE International Conference on Inventive Computing and Informatics (ICICI), Coimbatore, India, November 23-24, 2017, pp. 1011-1015. D.S. Sisodia, S. Vishwakarma, A. Pujahari “Evaluation of Machine Learning Models for Employee Churn Prediction". In Proceedings of IEEE International Conference on Inventive Computing and Informatics (ICICI), Coimbatore, India, November 23-24, 2017, pp.1016-1020. A. Anuragi, D.S. Sisodia “Alcoholism Detection using Support Vector Machines and Centered Correntropy features of Brain EEG Signals ". In Proceedings of IEEE International Conference on Inventive Computing and Informatics (ICICI), Coimbatore, India, November 23-24, 2017,pp.1021-1026. D.S. Sisodia, A. Verma “Prediction Performance of Individual and Ensemble learners for Chronic Kidney Disease". In Proceedings of IEEE International Conference on Inventive Computing and Informatics (ICICI), Coimbatore, India, November 23-24, 2017, pp.1027-1031. Dilip Singh Sisodia, Saragadam N., Gundu S. K., H. Shrawgi “Performance Evaluation of Learners for Analyzing the Hotel Customer Sentiments Based on Text Reviews". In International Conference on Recent Advances and Applications in Computer Engineering (RAACE-2017), Jaipur, India, November 23-25, 2017. D. S. Sisodia, A.K. Yogi “Performance Evaluation of Ensemble Learner on Smart Phone Sensor Generated Human Activity Data Set". In 1st International Conference on Data, Engineering and Applications 2017 (IDEA-2k17), Bhopal, India, October 28-29, 2017. (Proceedings in the Springer). D.S. Sisodia and N. R. Reddy “Sentiment Analysis of Prospective Buyers of Mega Online Sale Using Tweets". In Proceedings of IEEE International Conference on Power, Control, Signals and Instrumentation Engineering (ICPCSI), Chennai, India, September 21-22, 2017, pp.2734-2739. D.S. Sisodia T. Vandana and M. Choudhary “A Conglomerate Technique for Finger Print Recognition Using Phone Camera Captured images". In Proceedings of IEEE International Conference on Power, Control, Signals and Instrumentation Engineering (ICPCSI), Chennai, India, September 21-22, 2017, pp.2740-2746. D.S. Sisodia N.K. Reddy and S. Bhandari “Performance Evaluation of Class Balancing Techniques for Credit Card Fraud Detection". In Proceedings of IEEE International Conference on Power, Control, Signals and Instrumentation Engineering (ICPCSI), Chennai, India, September 21-22, 2017, pp.2747-2752. D.S. Sisodia and S.Verma "Analysis of Spamming Threats and Some Possible Solutions for Online Social Networking Sites (OSNS)". In Proceedings of International Conference on Computer Science, Engineering and Applications (ICCSEA 2015), Madrid, Spain, March 26-27, 2015, pp.1474-1478. D.S. Sisodia and S.Verma “Web Usage Pattern Analysis through Web Logs: A Review “ in Proceedings of IEEE Ninth International Joint Conference on Computer Science and Software Engineering (JCSSE 2012), Bangkok, Thailand, May 30-June 1, 2012, pp 49-53. Sisodia, D.S., and S. Verma. "Image pixel intensity and artificial neural network based method for pattern recognition." In Proceedings of International Conference on Computer, Electrical, and Systems Sciences, and Engineering (ICCESSE-2011), Singapore, September 28-30, 2011, pp.742-745. D.S. Sisodia and S.Verma “Static Hand Gesture Recognition System for Sign Languages: Using Error Back propagation neural network & Skin Color Modeling “In Proceedings of International Conference on Emerging trends in soft computing and ICT (SCICT-2011), Bilaspur, India, March 16-17, 2011, pp.132-134. Modeling of autonomous software agents’ behavior to defend HTTP request attacks, sponsored by Chhattisgarh Council of Science & Technology (CCOST). Funding Amount (In INR): 4, 90,000.00 Project Duration: Three years (from 2015 to present) Role: Sole Principal Investigator. Working as Assistant Professor at Department of Computer Science and Engineering, National Institute of Technology Raipur, Raipur, India from August, 2008 to present. Worked as visiting faculty at Department of Computer Science and Engineering, DSPM International Institute of Information Technology Naya Raipur, Raipur, India from January 2018 to May 2018. Worked as Summer Research Fellow at Machine Intelligence Unit, Indian Statistical Institute Kolkata, India from May 2013 to July 2013. Worked as Lecturer, Senior Lecturer and Assistant Professor at Department of Computer Science & Engineering/ Information Technology, Bansal Institute of Science & Technology, Bhopal, India (Approved by AICTE & Affiliated with RGPV, Bhopal) from July 2002 to July 2008. Worked as Lecturer at Department of Computer Science & Engineering, RKDF Institute of Science & Technology, Bhopal, India (Approved by AICTE & Affiliated with RGPV, Bhopal) from August 2001 to July 2002. CS20511 (CS) - Operating System Concepts (Autumn-2013, Autumn-2014, Autumn-2015, Autumn-2016, Autumn-2017, Autumn-2018). CS20845 (CS) - Artificial Neural Networks (Elective) (Spring-2016, Spring-2017). 322513(22) - Operating Systems (Autumn-2009, Autumn-2010, Autumn-2011, Autumn-2011, Autumn-2012). 322514(22) -Theory of computation (Autumn-2009, Autumn-2010, Autumn-2011). 322871(22) - Neural Networks and Fuzzy Logic (Spring-2009, Spring-2010, Spring-2011, Spring-2012). 322612(22)- Compiler Design (Spring-2009, Spring-2010, Spring-2011, Spring-2012). International Conference on Social Networking and Computational Intelligence (SCI-2K18), 08-09 March 2019, Rajiv Gandhi Proudyogiki Vishwavidyalaya (RGPV), Bhopal, India (Role: Program Co-Chair). National Conference on Soft Computing and Intelligent Techniques in Science and Engineering (SCITSE-2017), National Institute of Technology Raipur, November 25, 2017. (Role: Conference Secretary). National Conference on Recent Advancement in Computing, Communication, and Bioinformatics (RAC2B-2017), National Institute of Technology Raipur, December 9, 2017. (Role: Conference Secretary). One day workshop on Artificial Intelligence, National Institute of Technology Raipur, September 14th, 2017. (Role: Coordinator). Participated in a faculty enrichment program at AMDOCS India, Pune, India, August03-04, 2017. Participated in European Fellowship and Opportunities with Funding, International Institute of Information Technology Naya Raipur, Raipur, India held during September, 17th, 2017. Three-day short-term training program on Recent Trends in Artificial Intelligence for Big Data (RTAIB-2015), organized by Department of Computer Science and Engineering, at National Institute of Technology Goa, August 07-09, 2015. A five-week course on More Data Mining with Weka, hosted by Prof Ian H. Witten, Department of Computer Science, University of Waikato, New Zealand through MOOCs, April 28 to June 11, 2014. Workshop on Mathematical Modeling, Chemoinformatics, and Quantum Chemistry, organized by National Institute of Technology Raipur in association with SCUBE Scientific Software Solutions (P) Ltd, 09th February 2013. Workshop on Deployment and the collaboration of analytical reports & models, organized by National Institute of Technology Raipur in association with Analuo Predictive Analytics, 01st February 2013. Workshop on Convergence of Technology, Management, and Global Business, hosted by National Institute of Technology Raipur in association with EGAD Business School, Mexico, 20th November 2011. Workshop on Soft Skills Development, organized by National Institute of Technology Raipur through Campus Connect program in association with the Infosys Leadership Institute, Bangalore, India, August 28th -30th, 2009. Workshop on Management of Hazardous Waste, organized by HRD Foundation, New Delhi, in association with National Institute of Technology Raipur, and Sponsored by MOEF, Govt. Of India, August 21st-22nd, 2009. One week Induction Training Program on Value Education for Teachers of National Institute of Technology Raipur organized by Centre for Education in Universal Values, at NIT Raipur, March 09-13, 2012. ISTE & MHRD Sponsored Two weeks Workshop on Database Management System conducted by IIT Bombay through NME-ICT at Maulana Azad National Institute of Technology Bhopal, December 13-23, 2010. AICTE & MHRD Sponsored One-week short term course on Advances in Data Structures (ADS09) at Sardar Vallabhbhai Patel National Institute of Technology Surat, December 14-19, 2009. AICTE & MHRD Sponsored One-week short term course on Multidimensional Data analysis & data mining (STC-MDADM-09) at Visvesvaraya National Institute of Technology Nagpur, June 22-26, 2009. Three-week short-term course on Certified Linux user jointly conducted by Linux Solutions & Bansal Institute of Science and Technology Bhopal, at Department of CS& E, BIST Bhopal, June 06-25, 2005. Visited Bangkok, Thailand to present paper in IEEE Ninth International Joint Conference on Computer Science and Software Engineering (JCSSE 2012), Organized by School of Engineering, University of the Thai Chamber of Commerce Bangkok, Thailand. Visited Singapore, to present paper in International Conference on Computer, Electrical, and Systems Sciences, and Engineering, Singapore (ICCESSE 2011, Singapore). Senate Member, National Institute of Technology Raipur, from 12th September 2016 to 6th September 2018. Head of the Department, Computer Science and Engineering, National Institute of Technology Raipur, from 12th September 2016 to 6th September 2018. Warden, Boys’ Hostel-A (MANPAT), National Institute of Technology Raipur, from March 2009 to present. Chairman, Departmental Research Committee (DRC), Computer Science and Engineering Department, National Institute of Technology Raipur, from 2016 to present. Chairman, Departmental Purchase Committee, Computer Science and Engineering Department, National Institute of Technology Raipur, from 2016 to February 21, 2019. Chairman, Departmental Academic Committee (DAC), Computer Science and Engineering Department, National Institute of Technology Raipur, from 2016 to September 6, 2018. Chairman, Departmental Grievance Committee (DGC), Computer Science and Engineering Department, National Institute of Technology Raipur, from 2016 to September 6, 2018. 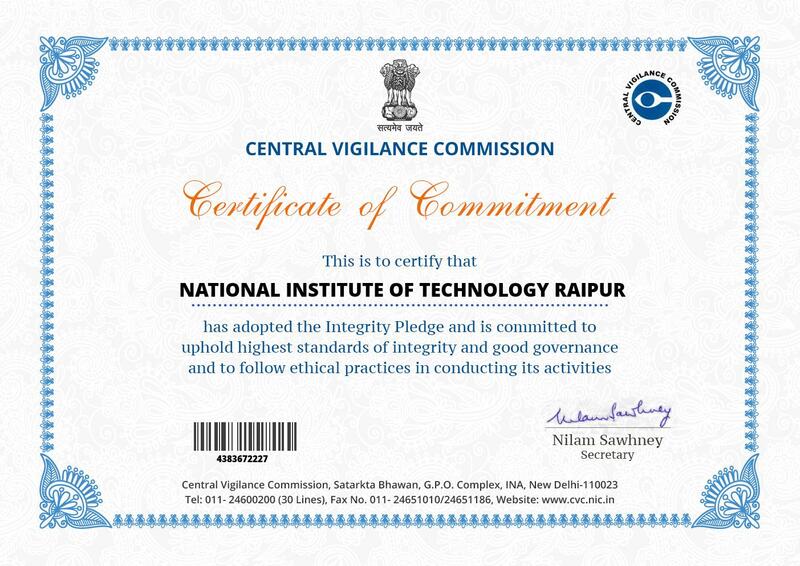 Member, Central Purchase committee, National Institute of Technology Raipur, from June 5, 2018 to present. Member, Recruitment Committee for Regular Technical Assistant (TA) and Lab Attendant (LA) Appointment, 2007. Chairman, Temporary Faculty Interview Committee, Computer Science and Engineering Department, 2016-17, National Institute of Technology Raipur. Faculty Adviser, Association of Computer Engineers (ACE), Computer Science and Engineering Department, National Institute of Technology Raipur, from 2008 to 2016. Coordinator, Special Classes for Academically Weak Students (Under TEQIP), Computer Science and Engineering Department, National Institute of Technology Raipur, 2014. Coordinator, Departmental Accreditation Committee (Part-B), Computer Science and Engineering Department, National Institute of Technology Raipur. Coordinator, Departmental Testing, and Consultancy, Computer Science and Engineering Department, National Institute of Technology Raipur, from 2011 to present. Member, Department Monitoring Committee, Computer Science and Engineering Department, National Institute of Technology Raipur, from 2013 to present. Member, Departmental Academic Committee (DAC), Computer Science and Engineering Department, National Institute of Technology Raipur, from 2014-2016. Member, Departmental Grievance Committee (DGC), Computer Science and Engineering Department, National Institute of Technology Raipur, from 2014 to 2016. Member, Departmental Board of Studies (BoS), Computer Science and Engineering Department, National Institute of Technology Raipur from 2008- to 2014. 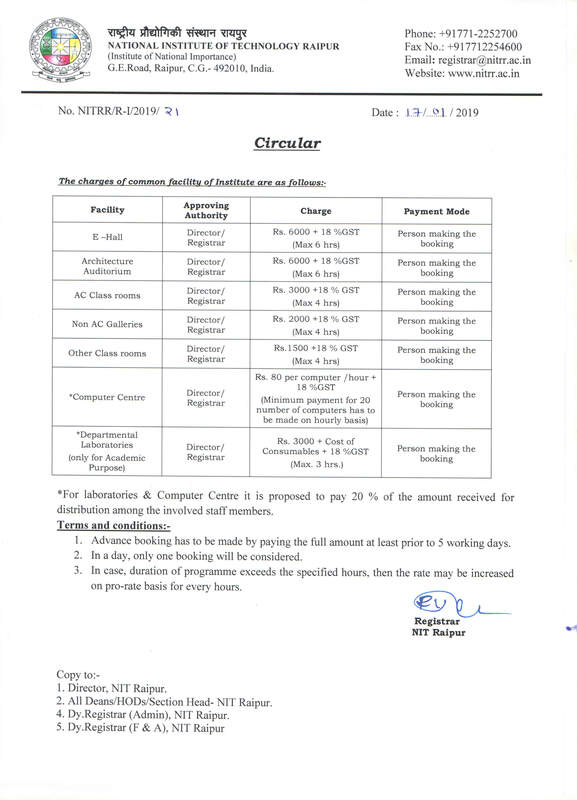 Member, Departmental Purchase Committee, Computer Science and Engineering Department from 2012-2016, NIT Raipur. Faculty In-charge, Advance Computing Lab, Computer Science and Engineering Department, National Institute of Technology Raipur, from 2008 to present. Coordinator, MIS (Boys’ Hostel Management Module), National Institute of Technology Raipur, from 2012 to present. Coordinator, Boys’ Hostel admission rule formation (Seat-Matrix) Committee, National Institute of Technology Raipur, 2014. Chairman, Boys’ Hostel Admission Committee, (Session 2014-15, Session 2017-18, Session 2018-19), National Institute of Technology Raipur. Member, Boys’ Hostel Admission Committee, (2013-14, 2014-15, 2015-16, 2016-17), National Institute of Technology Raipur. Member, Hostel Disciplinary Rules formation Committee, National Institute of Technology Raipur. Member, Hostel Management software development Committee, National Institute of Technology Raipur, 2012. Member, Scrutiny Committee for Regular Faculty Appointment (2009, 2013 and 2014), National Institute of Technology Raipur. Member, Temporary Faculty Interview Committee, Computer Science and Engineering Department (2009- 2011, 2014, 2015, 2016, 2017, 2018), National Institute of Technology Raipur. Member, Interview Committee for Faculty Appointment (Contract) in MCA (2012), National Institute of Technology Raipur. Member, PG (M.Tech.) Admission Committee (CCMT 2015, CCMT 2016, CCMT 2017, CCMT 2018), NIT Raipur. Member, PG (MCA) Admission (NIMCET 2009) Committee, NIT Raipur. Member, UG (B.Tech. & B. Arch.) Admission Committee (AIEEE 2009, JoSAA 2017, JoSSA 2018), National Institute of Technology Raipur. Member, Institute level Technical Activity Organizing Committee, NIT Raipur, July 2012 to June 2016. Member, Institute level Discipline and Anti-Ragging Committee, NIT Raipur, August 2008 to present. Member, Organizing committee, National level Techno-Cultural program “ECLECTIKA,” National Institute of Technology Raipur, from 2009 to present. Head of the Department, Computer Science & Engineering and Information Technology, Bansal Institute of Science and Technology Bhopal, from 2006 to 2007. On-Campus Trainer for Campus Connect program of Infosys, Bangalore, Bansal Institute of Science and Technology Bhopal, from 2006 to 2007. Team leader/ planner (As a Head of the Department) of the NBA accreditation work of CS&E and IT Department, Bansal Institute of Science and Technology Bhopal, from 2006 to 2007. Warden Boy’s Hostel, Bansal Institute of Science and Technology Bhopal, from 2003 to 2005. Chairman, Anti-Ragging /Proctorial Committee, Bansal Institute of Science and Technology Bhopal, from 2007 to 2008. Professor I/C for college Timetable, Bansal Institute of Science and Technology Bhopal, from 2006 to 2007. Member, Organizing Committee, National level Techno-Cultural program “ANTRAPRVAH”, Bansal Institute of Science and Technology Bhopal from 2003 to 2007.
International Conference on Social Networking and Computational Intelligence (SCI-2K18), Bhopal, India, March 08-09, 2019. Springer’s 3rd International Conference on Data Management, Analytics & Innovation (ICDMAI-2019), Kualampur, Malaysia, January18-20, 2019. IEEE International Conference on Advanced Computation and Telecommunication (ICACAT-2018), Bhopal, India, December28-29, 2018. Springer’s 4th International Conference on Next Generation Computing Technologies (NGCT 2018), Dehradun, India, November21-22, 2018. IEEE Fifth International Conference on Parallel, Distributed and Grid Computing (PDGC-2018), Shimla, India,20-22 December 2018. Futuristic Trends in Network and Communication Technology (FTNCT-2018), Waknaghat, India, 9-10 February 2018.
International Conference on Innovative Research in Science, Management and Technology (ICIRSMT-2018), Bilaspur, India, 04-05 August 2018. Springer’s Second International Conference on Advanced Informatics for Computing Research (ICAICR-2018), Shimla, India, 14-15 July 2018. Springer’s International Conference on Applications of Computing and Communication Technologies (ICACCT-2018), Delhi, India, March 09, 2018. Springer’s 2nd International Conference on Data Management, Analytics, and Innovation (ICDMAI 2018), Pune, India, January 19-21, 2018. Springer’s International Conference on Machine Intelligence and Signal Processing (MISP-2017), Indore, India, December 22-24, 2017. IEEE 3rd International Conference on Computational Intelligence & Communication Technology (ICICT-2017), Delhi, India, February 12-13, 2017. Springer’s 1st International Conference on Data, Engineering and Applications 2017(IDEA-2k17), Bhopal, India, October 28-29, 2017. Third-International Conference on Computational Intelligence and Communication Technology (IEEE-CICT 2017), Ghaziabad, India, February 9-10, 2017. Springer’s International Conference on advanced informatics for computing research (ICAICR-2017), Jalandhar, India, March 17-18, 2017. IEEE First International Conference on Data Management, Analytics, and Innovation (ICDMAI – 2017), Pune, India, February 24-26, 2017. IEEE Second International Conference on Computer Graphics, Vision and Information Security (CGVIS 2017), Kolkata, India, February 20-21, 2017. 11th IEEE International Conference on Computing for sustainable global development (INDIACom-2017), Delhi, India, March 01-03, 2017. IEEE International Conference on Control Computing Communication and Materials (ICCCCM-2016), Allahabad, India, October 21-22, 2016. 6th IEEE International Advance Computing Conference (IACC 2016), Bhimavaram, India, February 27-28, 2016.
International Conference on Signal, Networking, Computing, and Systems (ICSNCS-2016), Delhi, India, February 25-27, 2016. 2nd IEEE International Conference on "Next Generation Computing Technologies" (NGCT-2016), Dehradun, India, October 14-16, 2016. 2nd IEEE International Conference on Computational Intelligence and Communication Technologies (CICT-2016), Ghaziabad, India, February 12-13, 2016. Second International Conference on Advances in Computing and Management (ICACM-2016), Pune, India, January 15-17, 2016. 1st IEEE International Conference on "Next Generation Computing Technologies" (NGCT-2015), Dehradun, India, September 4-5, 2015. 9th IEEE International Conference on Computing for sustainable global development (INDIACom-2015), Delhi, India, March 11-13, 2015. IEEE International Conference on Electronics, Communication and Computational Engineering (ICECCE 2014), Hosur, India, November 17-18, 2014.
International Conference on Computing and Communication Technologies (ICCCT 2014), Allahabad, India, September 26-28, 2014. 8th IEEE International Conference on Computing for sustainable global development (INDIACom-2014), Delhi, India, March 05-07, 2014. IEEE National Conference on Computer Vision, Pattern Recognition, Image Processing and Graphics (NCVPRIPG-2013) at Indian Institute of Technology, Jodhpur, India, December 18-21, 2013. 3rd IEEE International Advance Computing Conference (IACC-2013), Ghaziabad, India, February 22-23, 2013.
International Conference on Advanced Computing, Networking, and Informatics (ICACNI-2013), Raipur, India, June 12-14, 2013. Research Fellowship, Indian Academy of Sciences, Bangalore, Under Science Academies (IASc-INSA-NASI) Summer Research Fellowship Program, to work (with Dr. Sanghamitra Bandyopadhyay, FNASI, FINAE, Humboldt Fellow, Shanti Swarup Bhatnagar Awardee) at Machine Intelligence Unit, Indian Statistical Institute Kolkata, May 2013 to July 2013. Member, Board of Studies (BoS), Computer Science Engineering, Faculty of Engineering, Guru Ghasidas University( A Central University), Bilaspur (C.G. ), from December 2017 to present. Member, Board of Studies (BoS), Computer Science Engineering, Vishwavidyalaya Engineering College (VEC), Sarguja University, Ambikapur (C.G. ), from August 2018 to present. Member, Chhattisgarh State Committee, Institution of Engineers, India (IEI), from Computer Science Engineering Division, 2018-20. Member, Chhattisgarh State Committee, Institution of Engineers, India (IEI) from Computer Science Engineering Division 2016-2018. Chairman, Computer Society of India (CSI) Raipur Chapter (C.G.) 2016-2017. Vice Chairman, Computer Society of India (CSI) Raipur Chapter (C.G.) 2014-2016. Nominated for Best Citizens of India, International Publishing House, 2013. Nominated for Shiksha Rattan Pursakar. India International Friendship Society, New Delhi 2013. Secure 1st position in MPPSC-2008 for Lecturer, Computer Science & Engineering, Department of Technical Education and Training, Govt. of MP.